Restoration Services: Does Your Business Have a Disaster Plan? As anyone in the Midwest knows, Mother Nature is a force to be reckoned with. From tornadoes to floods to blizzards to wildfire fires and more, living in the Midwest means you need to be prepared for the worst. Most households take the basic steps for disaster preparedness; maybe you stock your pantry with extra food, keep extra gallons of clean water on hand, and make sure the first aid kit is filled. But as a business owner, what steps are you taking? Many business owners neglect to make a disaster response plan for their business, leaving them vulnerable to potential disasters. Not being prepared means one natural disaster could end up shutting the doors to your business for good. 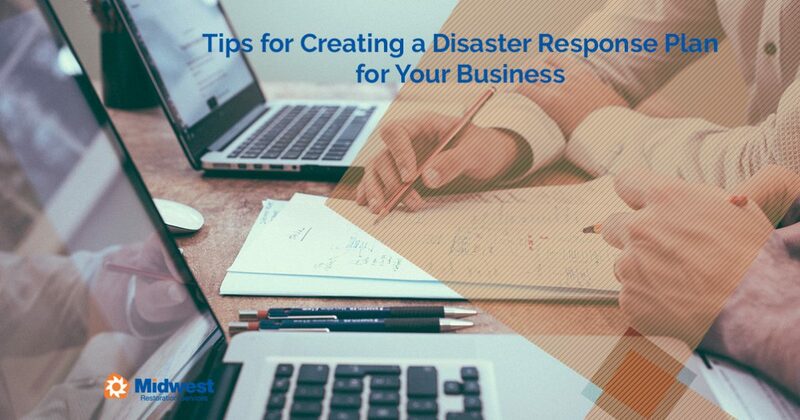 Fortunately, making a disaster response plan for your business doesn’t have to be difficult. You can visit Ready.gov for more information on the steps that you should take and ways that you can help plan for a disaster in order to get your business back up and running as soon as possible. Our restoration services team has worked with many businesses across Illinois after a natural disaster like a fire or a flood, aiding them in opening up for business again as quickly as possible. Through our experience, we’ve learned a lot about what it takes to prepare a business for a disaster. Here are some of the best tips we’ve learned and seen in action over the years. Backup your data daily and offsite. Getting access to your data again as quickly as possible is vital to your business. Losing all of your data, including customer records, transaction history, and inventory lists, could be fatal to your business. Make sure that you are backing up your data on a daily basis to an offsite, secure location. Make sure that everyone on your team knows how to back up the data as well as restore it again. Test your data backup periodically, too, just to make sure it’s working the way you expect it to and your team understands the process. Keep a list of backup vendors. If you are hit by a disaster, then there is a good chance that your vendors have been, too. That’s especially true if you try to source locally. In order to overcome supply chain issue, make a list of vendors who could supply you while your usual vendor is getting up and running again. Be sure to think about both your retail items as well as the items that you need to run your business, such as office supplies and computer equipment. Think about your service-based vendors, too, such as cleaning teams and tech support. Know what’s critical and what can wait. When disaster strikes, both your money and your time are going to have to stretch as far as possible. You can help make that happen by identifying what’s vital to your operation and what can wait. This includes both internal jobs as well as the equipment that you’ll need to get them done. Make a list of all the jobs within your organization, then identify the ones that are going to be crucial after a disaster. Then make a list of all of the supplies that are critical to those roles, including computers, desks, chairs, and office space. Know where you’ll find that stuff when you need it, too. That way you’ll have an idea about priorities in a disaster and will be able to allocate money and time where it’s needed the most. Involve your team in the process. Your team needs to know what the plan is in case of a disaster. It’s a good idea to review a disaster response plan on an annual basis with your team, establishing a clear chain of command in case you aren’t available to respond. That gives them the confidence to act after a disaster and understand what needs to happen so you can open your doors again quickly. They may be able to identify critical gaps in your plan, too, that you might not have thought of otherwise. Finally, make sure Midwest Restoration Services’ phone number is on hand. Program it into your phone. When your business goes through a disaster such as fire or flooding, we’ll be able to respond quickly to help you restore both your building and your equipment. Have questions about what we can do for you? Get in touch with our team today.